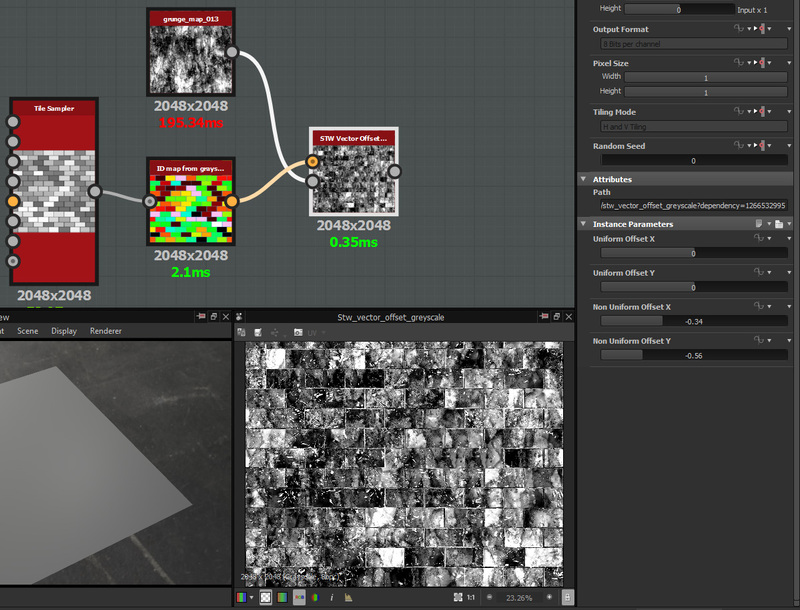 Just a simple custom node to make an ID map from a grayscale output. Could be used for assigning different material from a tile generator. Exposed parameters : number of colors , randomise colors assignment. Thx for sharing! This is actualy pretty useful for something that you probably haven't even thought of. You can colorize, say a grayscale heightmap of some woodplanks and use this as an vector offset input for a wood grain pattern that goes on top of it (so the grain is aligned uniquely on each plank). @r4di4nt Check this out: http://i.imgur.com/YZJlDSa.jpg. My vector offset node is based on this tutorial https://www.youtube.com/watch?v=SItBOrWIhNU It should work as an input for the stock vector warp node aswell. Im not sure what you're trying to achieve but if you want to make those lines thicker you have to play around with the levels on your grayscale map before plugging it into my node.